Before I go any further, a word of caution. It seems to me that, throughout his career, Patrick Ward, in true showbusiness style, wasn't averse to self-promotion or what today we'd call hype. In one interview1, for instance, he claimed to have made "hundreds of records for recording companies" and worked in "every film studio in France, Germany, Austria, California and New York". Further research may demolish my doubts - I hope it does - but, for now, I can't escape the feeling that more than a pinch of salt is called for here. Anyway, he also studied in the Royal College of Music in London and, in 1924, out of an entry of more than 300, won first prize in a contest open to tenors of all nationalities. He also sang at various concerts in the city, including one, in June 1926, in aid of "Earl Haig's Appeal for Distressed ex-Service Men in Southern Ireland"2. His brief recording career began in May 1927 when he recorded Macushla and Dear Love, Remember Me in London. Some months later, at a Gramophone Recital in a packed Theatre Royal in Dublin, Dear Love, Remember Me was played as a demonstration disc during a Gramophone Week publicity campaign. Under the heading OUR LOCAL TENOR "RECORDED", the Leinster Express praised the record and noted that "we have received intimation from the Beltona Company that owing to the phenomenal sale of Mr Ward's record, the first impression has been completely sold out, but a second supply will be available immediately". 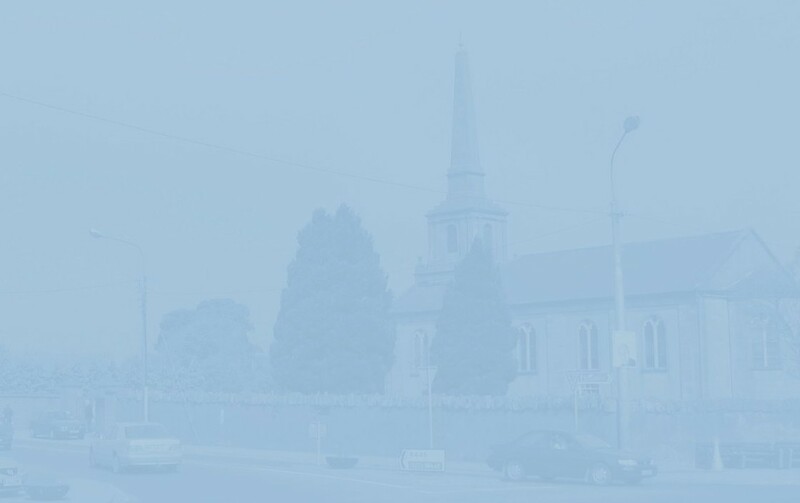 The record could be bought from Beltona's Portlaoise agents, Mr P. J. Delaney, Main Street - later Paddy Clear's hardware shop and Irish Nationwide Building Society but currently vacant - or Mr M. C. Carey, editor of the Leinster Express. If you come across Macushla in the attic or down behind the sideboard, I'd love to hear from you. [If you do happen to stumble on this or any very old records, remember that, presuming your turntable has the facility, they must be played at 78 rpm (and are likely to damage your stylus)]. 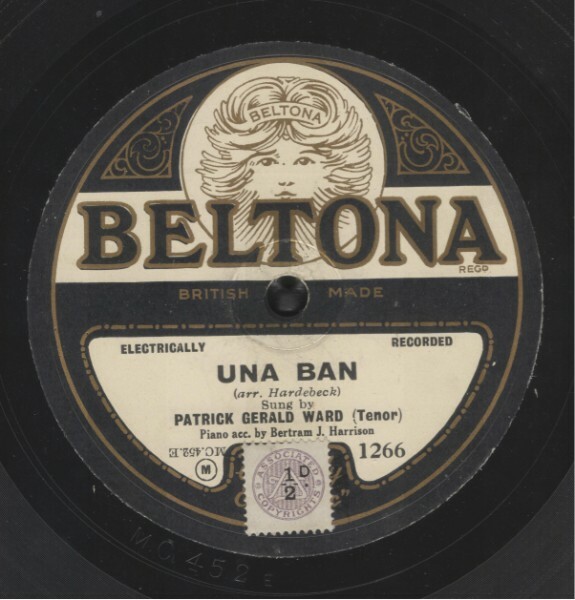 Patrick Ward's earliest recordings were released on the Beltona label. [Richard Thompson fans among you will, no doubt, be familiar with his tribute to "the best brand in the land"3 which, based in Edinburgh, is still going strong today]. Ward made at least four records for Beltona, the first as mentioned above and the second as shown below. 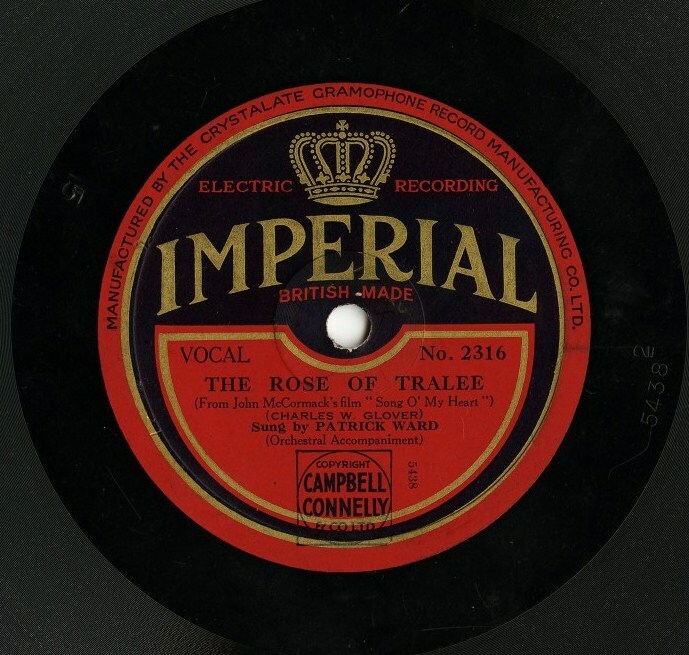 As far as I can ascertain, his version of the evergreen The Rose of Tralee was released in 1930. He may also have recorded for other labels in the late 1920's, but the only ones I am certain of are Ariel, Imperial and Parlophone, for which in 1928, he - excuse the 1960's terminology - cut at least ten tracks. [It was Parlophone, incidentally which released The Beatles early records and continued to do so until the band's own Apple records was founded in 1968]. Despite Ward's own estimation of his recorded output, my research would seem to indicate that it barely exceeded two dozen songs. I would love if someone can prove me wrong on this. 1 Bath & Wiltshire Chronicle & Herald. June 15, 1950. 2 Advertised in the Saturday Herald. June 26, 1926. 3 If you'd like a good laugh and, at the same, sharpen your terpsichorean skills, have a listen to Don't Sit On My Jimmy Shands on the Rumour and Sigh album.